Back in November, I called Beyond the Boundary a must-watch of the fall season. Two weeks back I called it one of the top five anime of 2013. So now, let's break down in detail what makes Beyond the Boundary so great. The world itself is perhaps the greatest star of Beyond the Boundary. Set in modern times, the world of Beyond the Boundary, is clearly a world hidden within our own. While we, normal humans, never see them, there are numerous Japanese spirits, monsters, and gods—called “Yomu”—which move through the shadows of our world. Some of the Yomu are human looking—or at least have human forms—while others look truly monstrous. Some even seem more like separate realities than anything physical. But more than just having a compelling world is how Beyond the Boundary presents said world to us, the viewers. Namely, we are thrown head-long into the world and are expected to catch up on our own. Very little of the setting is explained through expository dialogue. After all, the entire cast of the series knows how the secret half of the world works—explaining it among themselves would be foolishly redundant in context. However, that is not to say no information at all is explained to us as Mirai—being a newbie to the area—is able to ask the questions that are vital to our understanding of the plot. When it comes down to it, Beyond the Boundary is the tale of two characters: Akihiko, an immortal half-human half-Yomu, and Mirai, a Yomu hunter with the ability to control her own blood and use it as a weapon. While it does not appear so at first, both are outcasts due to their inborn talents. As a hemokinetic, Mirai is considered cursed and is actively shunned by the Yomu-hunting community. Akihiko, while objectively treated better by those around him, is no less isolated as those that appear to be his friends are really guards tasked with containing—or killing—him should he go out of control. Watching how their common outcast nature draws the two together into friendship—and later, love—is the emotional core of the entire anime. Beyond the Boundary thrives on its own quirky sense of humor. Whether its Akihiko's obsession with girls in glasses or Mirai's constant quips about how everything is “unpleasant,” there are a lot of laughs to be found amongst the series' dramatic moments. (And the supporting cast is no slouch in that department either.) All the comedy comes to a head around the series' midway point where the cast tries to kill a particularly annoying Yomu who covers his victims in a smelly bile when startled and can only be distracted by pretty girls singing pop songs. It is exactly as hilarious as it sounds. [Skip to the next section to avoid major spoilers.] 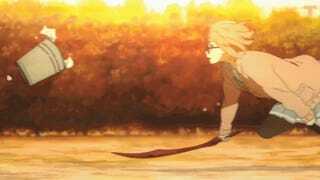 The twist in Beyond the Boundary is not one of plot as much as it is of characterization. While both Akihito and Mirai are main characters, it is Akihito who we spend more time with. However, over the course of the series, we learn much of Mirai's past—enough that it seems safe to assume we know the motivations to all of her actions thus far. Except that while all her actions appear to stem from her being an example of the “talented but shunned” archetype commonly seen in anime, we eventually discover that everything she has done in the series had a completely different—i.e., far more sinister—motivation. In other words, the twist is built on our—and Akihito's—assumptions, and it brilliantly forces us to re-adjust how we view her and her role in the series. Beyond the Boundary is a truly beautiful anime to watch. The characters and Yomu all have distinct and creative designs. And, while the backgrounds are often dark, attacks in the action scenes have a luminous brilliance that turn each fight into a visual feast. Moreover, the artistic design, mainly in how the various magics appear, are both striking and otherworldly. And like the summer season's Sunday Without God, Beyond the Boundary makes great use of sunsets and other transitional lighting to great effect. If you are aching for some eye candy, Beyond the Boundary is definitely the place to get it. Of course, the other side of having very little straightforwardly explained to you is that it is quite easy to get lost if you aren't hanging on every word. Paying careful attention becomes even more important as the show goes on. This is most true in the final three or four episodes, where important information comes in a rush. Characters’ true motivations and plans are revealed left and right, with scenes of otherworldly action coming in quick succession. For some, this may be one anime that requires a re-watch of the last few episodes in order for everything to make sense. In the end, Beyond the Boundary is a great anime and truly one of the best of last year. It has excellent characters, a believable love story, an exciting world, and an offbeat humor that I personally could not get enough of. If you like modern fantasies, captivating settings, and beautiful art, Beyond the Boundary is definitely for you. Beyond the Boundary aired on Tokyo MX in Japan. It can be watched for free with English subtitles on Crunchyroll and Hulu.